The martial art of Muay Thai (Thai Boxing) is one of the most popular spectator sports in Thailand, and is gaining world renown. The exciting world of Muay Thai is a martial art, like no other, and is a proud heritage of a nation. The history of Muay Thai is interwoven with the history of the Thai people. The Thai people are gentle and peace-loving but for centuries they had to defend themselves and their land from aggressive powers. The martial art developed from a form of close hand to hand combat, which was appropriate to the rough terrains of the battlefields. King Naresuan the Great (1555-1605), a celebrated warrior-hero, made Muay Thai a required part of military training. One of Muay Thai's historic heroes was Nai Khanom Tom, who beat ten Burmese boxers in a row in 1774 under the audience of a Burmese king, after the Thai capital fell in 1767; he won his freedom and became a Thai legend. In these early days, Muay Thai was a dangerous sport, with no safety gear of any kind for the fighters, and boxers would wrap their fists in thick horsehide trimmed with cotton soaked in glue and broken glass for maximum impact with minimum knuckle damage. Since then many changes have been initiated to make the sport safer, but is still a violent contact sport and considered by many as the ultimate in unarmed combat. Nowadays there are many Muay Thai training establishments across the country, and boys as young as eight years old attend. Their ultimate dream is to fight at the famous Lumpini or Ratchadamnoen stadiums in Bangkok. In 1997, the Muay Thai Institute was founded and is now the only training school accredited by the Ministry of Education. During a visit to a Muay Thai fight, you will witness a pure spectacle of the passion and drama of one of Thailand's historic sports. On one side of the ring is a musical band section, comprising a Javanese clarinet, drums and cymbals. The music accompanies the fight from beginning to end. The tempo rises according to the action inside the ring, even though the musicians have seen just about anything and everything before. You will witness lethal kicks and artful feints, powerful grappling, furious punches, and crushing elbow strikes - all executed to loud cheers from the crowd and the heart-racing tune of the accompanying wind-and-percussion ensemble. The training of a Thai boxer and particularly the relationship between the boxer and teacher is very symbolic. As the boxers enter the ring, they perform a special pre-fight dance ( ram muay ). 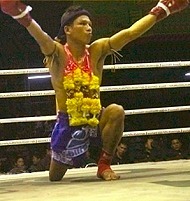 The dance starts with "wai khru " when each boxer kneels and bows three times, to show respect for his teacher. During the dance, they wear a headband ( mongkhol ) given by their trainer. It is a sacred talisman earned after many years of dedication to the art. The headband is believed to bestow luck to the wearer since it has been blessed by a monk or the boxer's own teacher. Since Buddhism and the teacher play important roles in the life of Thais, the headband is both a lucky charm and a spiritual object. It will be removed after the wai khru dance, and only by the boxer's trainer. Armbands, are also worn, and they are believed to offer protection and are only removed when the fight has ended. With the ceremonies complete, the fight begins. And a ringside seat is highly recommended. - muay lak which puts the emphasis on caution and patience, and is very rare nowadays. - muay kiew which is full of tricks and feints performed to catch the opponent off guard. There are 16 weight divisions in Thai boxing, ranging from mini-flyweight to heavyweight, with the welterweight division (67kg maximum). As in international style boxing, matches take place on a 7.3 sq. m canvas covered floor with rope retainers supported by four padded posts, rather than the traditional dirt circle. All surfaces of the body are considered fair targets, and any part of the body except the head may be used to strike an opponent. Common blows include low crescent kicks to the calf, high kicks to the neck, elbow thrusts to the face and head, and knee hooks to the ribs. A contestant may even grasp an opponent's head between his hands and pull it down to meet an upward knee thrust. Punching is considered the weakest of all blows and kicking is used to soften up one's opponent. Most matches end with a knee or elbow strike. A match is decided by a knockout or by points. Three judges decide who wins each round. The overall winner is the one who wins the most rounds. The referee plays a very important role, especially with regard to the boxer's safety. There is a Muay Thai boxing arena at Bang Niang, near the bus station and fresh food market. Muay Thai fights take place here every Friday. In addition, there is a also a Muay Thai gym for professional training behind this boxing arena. They provide Muay Thai classes for everyone - beginner, intermediate or advanced. Their experienced trainer is Khun Kru Gai, who is a former Muay Thai boxing champion. There ae also fights at the Rawai Muay Thai gym on the last Saturday of every month. (a) Equipment that is necessary for Muay Thai matches must be provided by the stadium. These are a stopwatch, a signal gong, a warning bell, boxing gloves of various sizes according to the rules, equipment to provide water for boxers, and other additional personal accessories for boxers who have not prepared their own (such as boxing shorts in red or blue, jock straps, surgical tape, or sacred cords). (b) Muay Thai is fought in five three-minute rounds, with two-minute breaks between rounds. No additional rounds are allowed. (c) Contestants must regularly wear gloves, each weighing not less than 6 ounces (172 grams). The gloves must not be squeezed, kneaded or crushed to change their original shape. (d) Contestants must wear only red or blue trunks (according to their corners), which should appropriately fit their bodies. (e) Contestants must wear standard supporters or sturdy athletic cups (jock straps) to protect their groin. (f) Contestants may use a Gum shield. (g) Contestants must not wear any shirts or shoes, but ankle caps are permitted. (h) A sacred cord known as a Mongkol can be worn around the head only during the pre-fight ritual of paying homage to ancestral teachers of Muay Thai, (to be removed before the start of the fight). (i) Metal or other equipment that will be harmful to the opponent is prohibited. Muay Thai kickboxer Buakaw Por Pramuk (the "white lotus") is a national hero whose performance in the ring has also earned many fans overseas. He is the holder of three national title belts. He is a Thai welterweight Muay Thai kickboxer, fighting out of Por Pramuk Gym in Bangkok. He is a former Omnoi Stadium champion and two time, 2004, 2006 K-1 World MAX champion.